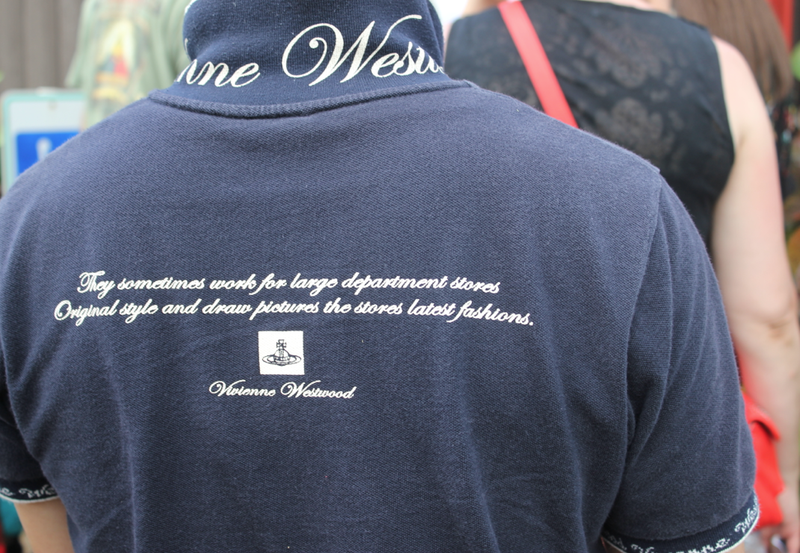 Bonni Brodnick Blog : Vivienne Westwood: You call this a "Fashion Statement"? Vivienne Westwood: You call this a "Fashion Statement"? While standing in line at the Polynesian Cultural Center on Oahu, I was perplexed by the slogan on the back of the gentleman's (obviously knock-off) shirt in front of me. Original style and draw pictures the stores latest fashions." It reminded me of tattoos that go awry when the person thinks they are laying down something spiritual and in reality it means something like, "I like the zen of nested rats at other times cats will do. In here." Getting back to the blue shirt: Are we calling this a "fashion statement"? Anyone want to venture a guess as to what the hell it means? ?